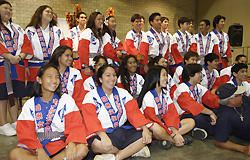 Kamehameha High School, Maui Campus’ Japanese I students, winners of the 5th Annual Maui Mikoshi Design Contest for the second straight year, will march with their winning mikoshi. Japanese Language teachers Mr. Kealii Mossman and Mr. Jared Mateaki along with thirty students have incorporated the theme “Pacific Harmony-Experience the Wonder” into their portable float design. Please look forward to share in their joyous celebration.